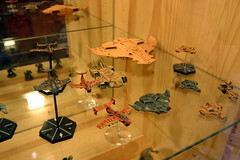 These are various ships form the Forgeworld range. I am very interested in the Tau drop ship which would make an excellent addition to an army in Future War Commander. I think it is generic enough to use as a SCI-FI dropship for another faction (or my own army) without modification. It is in the centre of this photo.